Paul Tukey, the author of The Organic Lawn Care Manual, visited Martha Stewart’s Bedford, New York estate recently to offer advice regarding the health of her lawn and fields. He is a firm believer of spraying lawns and plants with Compost Tea. And fortunately, Martha has a Growing Solutions Compost Tea System25 in her greenhouse! Growing Solutions encourages you to view this great video from Growing Wisdom. The video features Scott LaFleur, of Garden in the Woods, and is about producing and applying Compost Tea. He emphasizes that Compost Tea feeds the soil, which in turn benefits the plants; without the need for chemical fertilizers! We would like to note that you don’t need to add quite so much compost to the basket when brewing a ten gallon batch of Compost Tea. We recommend about seven cups of a high quality, organic compost, and seven tablespoons of our Compost Tea Catalyst. We gathered in the Growing Solutions office to launch a project with two student groups from the University of Oregon’s Lundquist College of Business. The student teams are performing essential due diligence for GSI, regarding the technical specifications, sourcing and distribution pipelines for a new product line we will introduce later in the year. A product that will appeal to home gardeners and rural farmers alike. Growing Solutions has a new page on Facebook! If you are a Facebook member already, you can sign in and then enter Growing Solutions in the search box. You can become a “fan” or simply browse the pictures of our Compost Tea Systems and information. We will be adding more content soon. If you aren’t a Facebook member yet, you may click here to be taken to the page. On behalf of Growing Solutions, Michael Alms and the GSI European Distributors gathered in The Netherlands recently for the 10th annual Horti Fair held in the Amsterdam RAI Center. The Growing Solutions company philosophy and product line integrated well with the Horti Fair 2009 Exhibition theme: “For a Sustainable Future.” The event, covering six hectares (15 acres) of floor space was home to over 700 exhibitors, attracting attendees from over 100 countries. The subject of Compost Tea was a hot topic during the fair. The Growing Solutions Team engaged in a multitude of discussions regarding the use of Tea across a broad range of crops as a beneficial and cost effective alternative to conventional methods of plant production. 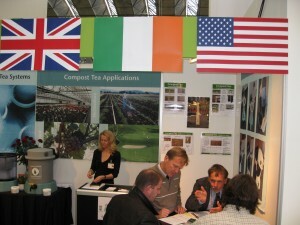 In addition to supporting the existing Growing Solutions distributor base in Holland, Belgium, Great Britain, Ireland, Germany, Austria and Switzerland the event attracted business opportunities from over 20 new countries including the regions of Africa, Eastern Europe, South East Asia and The Americas. 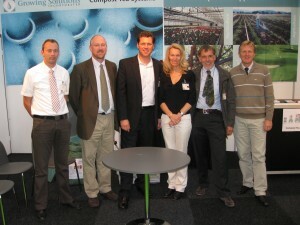 “Horti Fair 2009 was clearly a strategic event for our Distributors to attend. The event platform afforded our Team the ability to showcase their Compost Tea products and services, offering solution driven alternatives to the inevitable shift in conventional growing techniques,” according to Michael Alms. Marc Verhofstede and Urs Hildebrandt, providing in depth detail to attendees from France. 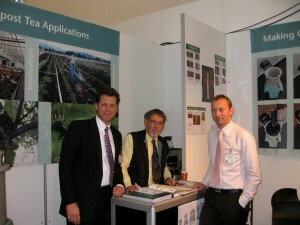 Michael Alms, Urs Hildebrandt and Jitze Peenstra at the 2009 Horti Fair.